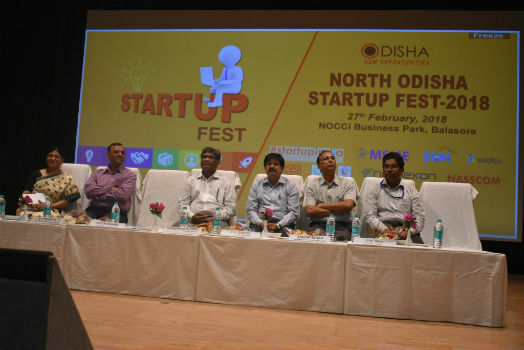 Balasore: NOCCi organized the second edition of NORTH ODISHA STARTUP FEST- 2018 on 27/02/2018 at NOCCi Business Park, Balasore with the support of the Software Technology Parks of India (STPI), KIIT-TBI, Bhubaneswar, SIDBI and MSME, Govt of Odisha. The main objective of this fest was to create a platform to discuss new business & enterprise idea, both in IT & manufacturing field, before potential angel investors, bankers, & learn about the available ecosystem in the State, & government incentives. 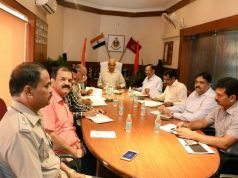 The infrastructure available for incubating new enterprise idea in Balasore would also be showcased. Shri Ghashiram Murmu, General Manager of DIC, Balasore inaugurated the fest by lighting lamp in the presence of Shri C P Bhartia, NOCCi Secretary, Dr. Aseem Mishra, CTO, KIIT-TBI, Bhubaneswar, Ms. Sujata Dash, Reader, IT of North Odisha University, Baripada, Shri P K Sahoo, Chief Manager (Project) APPT, Balasore, Shri P K Das, Dy. Director, MSME Development Institute, Cuttack, Shri Anant Prasanna Behera, State Head, ILFS, Bhubaneswar, Shri Abhinav Bhatt, Senior Manager, E-Cell of IIT, Kharagpur and along with other senior officers of local industries and participants from Universities, Engineering /MBA colleges, IT institutions, IT professionals, Startup Entrepreneurs were present during the inauguration. All the above signatories spoke and encouraged to the present participants and prospective entrepreneurs, while Shri Subrat Nayak, Chairman of Social Development Panel of NOCCi concluded the inaugural session with vote of thanks. Experts/resource persons from KIIT-TBI, E-Cell of IIT, Kharagpur, North Odisha University, STPI, department of MSME, Odisha angle investors, and mentors participated in the fest. Ms. Ishita Gupta of Professional Academy, Ms. Supreety Mishra, of First Choice, Shri Priyadarshi Sadangi of Knowlexon Innovation & Technology (P) Ltd, Shri Chandra Shekhar Rout of Orduinur Lab, Shri Shanti Swarup Mohapatra of Softcad Info Tech Solution, Shri Raj Kishore Mishra of Expert Exchange, were the successful startup entrepreneurs from Odisha and shared their experience with participants. About 280 participants from FM University, technical colleges/institutions of Balasore attended in the fest. During technical session, mentors/speakers/angel investors delivered their presentation for supporting new enterprises, and help for job creation. The fest was followed by the pitching session a dozen successful entrepreneurs from Odisha & other states participated and shared their business ideas. 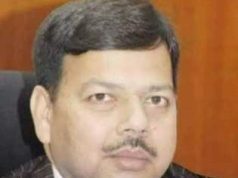 Shri C P Bhartia, Shri Amit Behera, Shri Mukesh Patel, Sri Arun Kumar Rathi, Shri Subrat Panigrahi, Shri P K Sahoo were the jury members while Shri Subrat Nayk was the moderator and Dr. Aseem Mishra was the mentor of the session. Shri Harish Patel, Jt. Secretary of NOCCi concluded the fest with votes of thanks.